Are there ways we can tell whether Christ is alive within us? Are there “measurements” to being a disciple? In other words, should we be able to tell whether someone is alive in Jesus? Well…YES! Can you tell whether a person is married or not? You should! Can you tell whether a person is a parent or not? You should! Can you tell anything about a person’s real identity? Of course you should be able to! A Disciple is passionately alive…they can’t help it because the life of God through the Holy Spirit lives in them. A disciple who is alive grows – because it is something that God designed into the Universe – things that are alive grow! As Philippians 1:6 says, God isn’t through with you yet! A Disciple is alive in Jesus and because of that has access to inexplicable power…effortless and spontaneous in action, a disciple is not concerned about what is truly God’s business…in other words, a disciple obeys God and trusts God with outcomes. A Disciple exhibits the “fruit” of the Spirit’s life within their lives (see Galatians 5:22ff). A Disciple manifests the gifts of God (they are recipients of “every spiritual blessing in the heavenly places” Ephesians 1:3). Disciple is not necessarily a member (except being a member of Christ’s body) but on a mission. And Christ demonstrates HIS life within their lives through aspects of His divine nature being made known (“being incarnated”) through us (the New Testament calls these aspects of Christ’s nature given to His disciples “spiritual gifts”). Disciples build THE Church (the Body of Christ, being involved in the realization of the Lord’s Prayer petition, “Thy Kingdom come, Thy will be done on earth as it is in heaven”) not necessarily A church and especially not THEIR church…Jesus said, ”upon this rock I will build MY church” – not yours or someone else’s. A disciple is about making disciples. The Great Commission (Matthew 28:18-20) isn’t just a mission statement for the Church, it is a Disciple’s personal mission and lifestyle – they actively live a life where discipleship and disciple-making is the essence of who they are and what they do. You see, we need to understand the gift of God’s grace in eternal life…but we are misinformed about our part in eternal living. 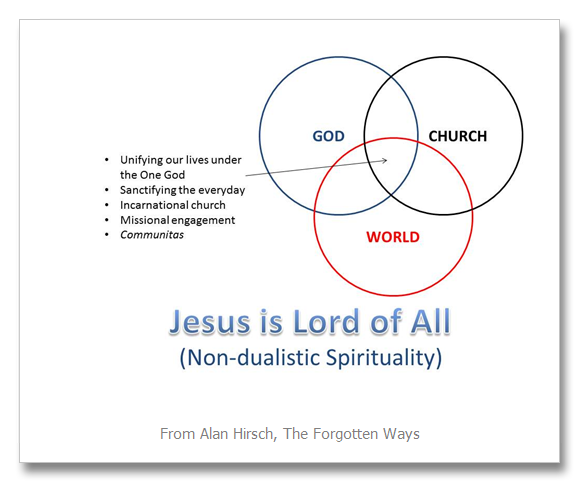 We have learned our part in the faith and practice by our group/denomination but not from Jesus himself. If Jesus is hidden in our lives…the power of the universe is shut down from being expressed in and through us by our choice to die rather than really live. And that’s what your friends, neighbors, and coworkers need to really see and experience in relationship – a person that is TRULY alive! Questions for thought and prayer – When you hear the words of Jesus in the Great Commission, who do you think of? Do you think of yourself? Why or why not? Here's where this is all coming from…many of us have seen people come alive in Jesus Christ. Without training, extensive study, without commissioning or titles or degrees, many of us have witnessed disciples supernaturally discipling others. We have seen people transformed from being dead bystanders to being active and alive, passionately sharing the life of Jesus with all who come in contact with them. For many of these people, being a disciple is not what they are aspiring to be or trying to pull off in the habits of their life…rather, it is something they know they are because they know the life of Jesus. In this instance, the Holy Spirit is producing fruit…they are not trying to be better people, attempting to be moral and upright and loving…they just are because of the power of God residing in their lives. If you were to type their blood, they would bleed Jesus. For a disciple, Jesus is not a cause to be understood and/or represented…Jesus is their life, pure and simple. Why have many of us missed the boat? Why all the discipleship ministries and programs and studies in the local church and few actual disciples? Why do we have to do hand stands and heroic efforts to convince people to share their life, tell their God-story, live out their faith with Kingdom courage? Could it be that we are a bit confused when it comes to being a disciple? Could it be that we are finding it extremely difficult to paint a compelling picture of the experience of being a disciple? Could it be that we have succumbed to drafting a legalistic, "doing" vision of what a disciple is that has actually not brought life to people who desire to follow Jesus? Could it be that all of our efforts have led people more into sin management and shallow spirituality that remains an addendum to an already busy and culturally defined life (through narrowly defined spiritual exercises like the infamous "10 or 20 minute quiet times) than into the very life of Jesus in and through them? I think we have gotten discipleship wrong and it is time to regain and then unleash the Disciple that lives within YOU! When some people talk about discipleship, they define it in primarily "privatistic" terms…as if being a disciple of Jesus is epitomized in a person's life as "private territory". Some describe discipleship as something that emerges out of a person's belief system, or that which is seen in an individual's devotional life (prayer, bible reading, quiet times, etc. )…for others it has to do with what a person "learns" about Jesus via doctrinal, apologetic, or theological exploration as if the more knowledge one has about God the more of a disciple they become. There is a problem with that though – cognition, mental assent, and doctrinal sophistication where never meant to be measurements of discipleship. Trust me…there is nothing wrong with knowing more about God and knowing God more. That should be one of the prime passions of every Christ follower. "So then, you will know them by their fruits" (Jesus in Matthew 7) – what are the FRUITS that should mark our lives? James 1:22 says we should not just be hearers of the Word but “doers”. What does that mean? How do we live that? Jesus said (John 14:15), “If you love me, you will obey me.” What does that mean for daily life for a Disciple? A book on prayer! Check it out because it may not be one you have heard about before! 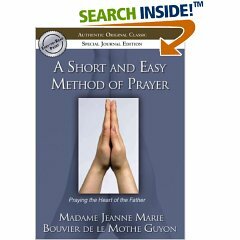 Here's a good book on prayer…it was written by Madame Guyon (if you know the story of this woman, you know that the name is a shorten version). If you don’t know anything about her, I would check out Wikipedia or Google her name and check out her life’s story. Quickly, she is a woman who grew up and lived during the time of the rise of Post-Reformation Scholasticism…during the mid-17th and 18th centuries where the Church was systematizing its faith and doctrine in a manner that only rivaled that of the early Nicene days. Madame Guyon’s life is a stark contrast (best referred to as a juxtaposition) between that of scholasticism and a “mystical” experience of God. I've been subscribing to John Pavlovitz' blog for some time now. I find his words challenging and insightful. This blog post that I'm posting today is worth a read. It says, as his blog posits, "what needs to be said." And that's true in this case. As difficult as it is for faith community leaders to hear, these thoughts are biblically and theologically true. Of course, there is a need for connection with the Body of Christ. I could pontificate for hours on that topic…for now I'll simply leave you with this article. Read it, wrestle with it and then ask yourself the question, "what have we done in local churches to get to the point where people feel this way?" Is there any action step that we need to take after reading these points? You might be tempted to marginalize John's thoughts…I wouldn't. I'm hearing so many people who are done…done…done with local church. I'm praying about this often, rather constantly. I know for me, I have to do something about this…you may too! I know those words so well, because I hear them every single day in some form or another; in emails, late night Skype sessions, and midday conversations across a coffee table. They’re a convenient one-size-fits-all phrase that covers a multitude of meanings for those of you who’ve joined the growing ranks of the weekend defectors, deciding to opt-out of organized religion. That seemingly simple phrase speaks to so many unique stories; stories of grief, and abuse and exclusion; stories of mistreatment, and isolation and indifference—all experienced in the name of God, all at the hands of God’s people. They’re words sometimes spoken in angry defiance, sometimes in anguished grief, and sometimes in quiet resignation, but regardless of those distinctions, they’ve all led to the same unfortunate place; separation. So many of you have shared with me the suffering you’ve gone through as part of local faith communities. It’s damaged or frustrated or wounded you so greatly that you’ve chosen to walk away. You’ve finally reached the saturation point of what you can endure and after years of attempted reconciliation and after one too many false starts or disappointments, you’ve decided that enough is enough—And now you stay home on Sundays. Or maybe you don’t just stay home but you definitely do stay away. You might lazily knock around the house during these mornings now, or grab breakfast at your favorite local spot, or walk your dog through the woods, or make your bed home base for a few cozy hours, filled with some combination of kids and pets and silence. Perhaps you steal a few quiet moments with coffee and a book, or calmly wrap your mind around the many needs of the busy week ahead; or you fill that Sunday space listening to music, or working on your car, or golfing with friends, or writing the latest chapter of the book you’ve been dreaming about for years. Maybe you meet another family at the park for a morning hike or you Skype with someone you haven’t seen in a while. Some of you do this with great joy, some with tremendous sadness, and many with a good deal of residual guilt. And you may have done all of it, thinking that you’ve left the Church, but the encouraging thing you need to hear today, is that you haven’t left God. In fact, not only haven’t you moved too far from the faith as you’ve made your weekend exodus from the church building, you’re as close to being the Church as you ever were. The Church after all was never a place anyway, it was always a people. It was a people communing with one another and with God, living life with reverence and gratitude and joy. And the great, beautiful, catalytic truth, is that you can do that right where you are, right now, this very Sunday. Those bed-top moments of belly laughter with your kids are as sacred as they come; the secluded wooded paths as holy a ground as you’ll ever walk upon; those meandering, intimate conversations over coffee as real a prayer as there is in the world; the table you share a meal with friends upon, as real a fellowship space as any packed worship service. You don’t need a band or an organist to worship. Your every waking moment can be an act of praise, your original daily song of adoration. You don’t need a pastor or other professional Christian to tell you what God is saying to you. You only need to quiet yourself and listen. You don’t need to recite a communal creed to pray. Each breath can be a prayer, as you live and move with attention to the sacredness of it all. You don’t need a big amphitheater or a brick building with a steeple to have the Church. Wherever two or more seeking souls are gathered, God is the guest of honor. You don’t need anyone else’s consent or oversight to learn, study, to find community, to serve, and most of all, to reflect the character of Christ in the world—period. This may be only a temporary secession from the Church building for you. You may one day find yourself drawn back to a local faith community, and Sundays may again look more like you remember church being before you stepped away. You may once more find acceptance and connection and meaning in the church of your past and that will wonderful. But even if that never happens, please know that you haven’t lost. Don’t let anyone tell you that you’ve abandoned faith or that you aren’t walking closely with God. Anyone who tells you that, simply hasn’t seen what you’ve now seen; that the true spiritual life, is a life lived completely open to the wonder and the work of God, one that far exceeds any building, or worship service, or ministry program. God is certainly present in the crowds and the noise, and in the large and special weekend gatherings you’ve come to experience as the Church, but God is also as surely present in the quiet, simple, unvarnished places of your ordinary. You are a breathing sanctuary, my friend and your faith is living as you live. It goes where you go. To those of you who stay home or stay away this Sunday, be encouraged: God is right where you are. He left the building long ago. 1. The Congregational Life Cycle – NO institution is Immortal. Studies are showing that the average life cycle of a local church is approximately 60 to 70 years (and that does not take into account cultural, sociological dynamics). 3 – The buzz word these days is "Millennials." No group wants to be hyper-analyzed. I've seen arguments on both sides of the spectrum…the scope of anticipated connecting/relational points often is contradictory and detrimental to actually building real relationships with Millennials and NOT treating them in a monolithic manner. It is true though that young people these days see themselves as free agents who are strong on social conscience but resistant to any institutionally based religious journey. 4 – The reality of the 21st century is that the "mega-church" is here to stay. There is a Programmatic attraction to large churches based on and fueled by consumeristic realities that is hard to deny and even harder to overcome for smaller faith communities. 5 – There is a growing Reality of congregational economics – sooner or later smaller congregations will not be economically viable. The true cost of "overhead" expenses (building, maintenance, even one staff member) will eventually drive any local church below 75 out of business. 6 – Reality of congregation narratives – every church in any town has a narrative – what is that narrative? What do people know about your church? Do they know anything? If so, what? If not, why not? 7 – Uniqueness of setting – every setting is unique. Urban, suburban, rural…these geographic realities make an impact on congregations. We have discovered that Monroe is NOT a rapidly growing municipality and because of that cannot depend on a rising population base to build local church adherents. 8 – The truth is that many churches and people in those congregations don’t have an accessible faith. The perceived boundary markers are exclusive, non-relational, and known for rigidity. 9 – Protecting a legacy or past acceptable ministry paradigms trumps empowering new leaders and stonewalls essential and necessary change. 10 – Ministry that is focused on management instead of equipping and releasing will have a shorten shelf life. 11 – To repeat a KEY reality – congregations are NOT immortal – consider that as you study life-cycles. The Body of Jesus is immortal…our expression of that reality is NOT. 1 – What is God’s Mission? What is our mission? Why do we exist as a congregation? What is God doing here? What is God doing that He isn’t doing anywhere else? 2 – Is what we are doing now sustainable? Are we sustainable? Should we be sustainable? How would the Kingdom or "your" Community be impacted if we as a congregation didn’t exist? 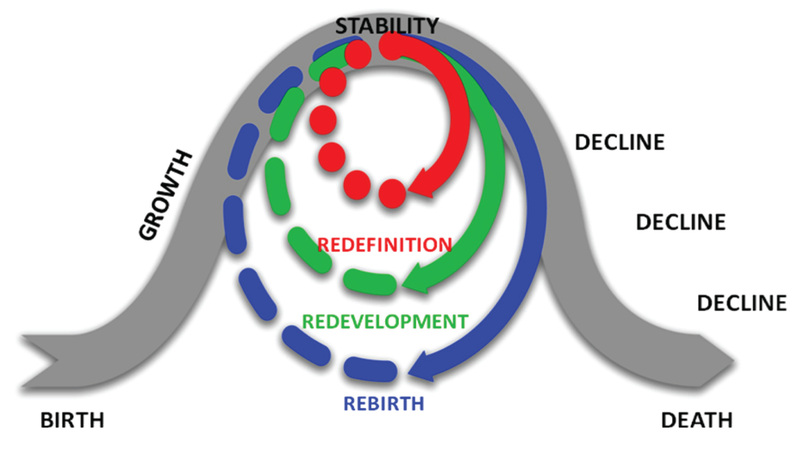 3 – Where do you think your church SHOULD BE on the life cycle chart? 4 – Are we in decline, dropout, or death? Why? 5 – What are the circumstances in our congregation that concern you? 6 – If our church were to close, what would you be afraid of losing? 7 – What is the worst-case scenario for our church? 8 – How can we minister to each other as we answer these questions? 9 – What do people perceive when they enter our building? What “age” does it communicate? Is that helpful or harmful in your opinion? 10 – Do you think our church is a healthy congregation? Why or why not? 11 – Jesus talked about bearing fruit…are we being fruitful? How? 12 – Why do we do Sunday services? If people stop coming, is that noticed? What if we cut all programs, how would people respond? Are we just a provider of religious goods and services? What is the purpose of a program? Is what we are doing central to the mission of God and engagement in that mission? 1 – MORE Accessible Worship experience/Church community – dropping or eliminating or altering much of our “denominational” barriers to having an accessible worship experience/community (see below). 5 – YOU WILL NOTICE – we can’t stay as is – I have to be a person that engages the congregation for the purpose of CHANGE and TRANSFORMATION – they are going to be our congregation’s reality as we move into the future. Rather than making people into clients for what we provide, we should be making disciples who can in turn go and make disciples. We can do this by ‘pruning’ out a lot of the management we do, and then start living the life. We form a core community, live life-on-life and reach out to others to bring them into the Kingdom. Like Jesus, we identify and call a group of disciples to go on a mission. Discipleship happens best relationally … very little change happens through compliance change. 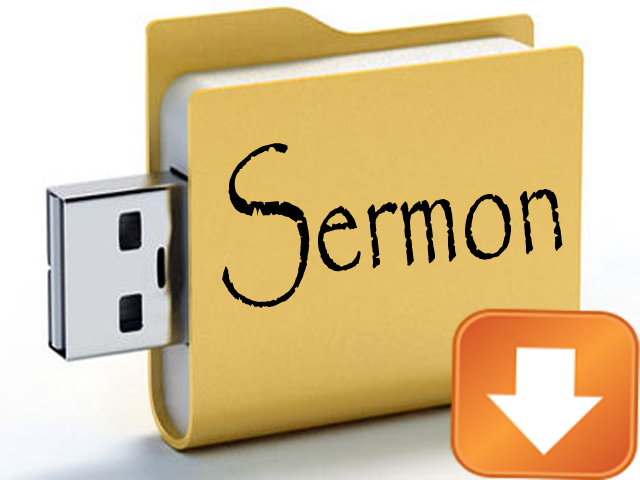 The Legacy and Longevity of the Sermon…blog post by Jeff Cook to check out! Okay, that’s a little a strong, but I would like to start a series reconsidering the role of teaching in the church service and argue that the sermon causes a host of problems and its benefits are not worth the cost. By “the sermon”, I do not mean a homily or discussion-propelled teaching. I do not mean the occasional address to paint priorities or guide the actions of a community. I mean the weekly 30-55 minute lecture on the Bible that sits at the center of most church gatherings. The sermon is not secondary for most churches. The sermon determines what happens in the time we gather. Often the worship plan begins with the sermon topic and everything else adjusts. Sermons not only are the centerpiece of most gatherings, but the primary reason many of us come together. Our spaces are constructed to elevate the speaking platform. Few churches grow beyond a few hundred without exceptional teachers, and as such when money is spent to expand the church, the focus is seats and the pulpit. It seems the most expensive church buildings recently constructed are simply large auditoriums for superstar teachers to proclaim biblical truths with childcare available on the side. Young church leaders may look at “the success” of such peers and challenge themselves to up their game communicating to ensure that they too can create a growing church. First, because the medium is the message, it’s worth asking what the medium of the sermon communicates. The sermon loves spectators. The sermon desires the crowd. The sermon requires very little in return from those assembled and perhaps that’s why we elevate it: you can remain anonymous at a church and still attend (by the way, here’s the collection plate). The sermon is not interested in dialogue. It is not interested in the most effective methods of teaching (lecture is always ranked near the bottom of successful styles of communication). The sermon is most interested in short term gain: inspiring the masses for the day. As a medium, the sermon shows us that we think discipleship occurs best through listening to a local scholar. The sermon tells us the biblical opinion of the teacher is worthy of gathering weekly. The medium of the sermon tells us how we think truth about God is disseminated. The sermon deemphasizes experience and elevates propositional knowledge. And the sermon teaches us to sermonize when speaking to others about God. The sermon-medium teaches me that if I have the message of God for my culture (to my friends at work, to my family table, to those at the bar), I will sermonize when speaking about God—because that is how I’ve been taught. Dialogue through difficult theological matters is seldom elevated in the local church let alone the church gathering. Worse still, the medium of the sermon reduces thinking. What the sermon does is create Christians who are increasingly ineffective at actually talking to people who disagree with them. Because the way we experience and process information about God is often custom fit to our pre-held beliefs, the sermon trains us–not to process and communicate–but to parrot and talk down to others. I submit this kind of approach to engaging those who disagree comes from the sermon: we are used to the person informed by God telling us what we need to do and believe and not having an opportunity to respond and if we actually love God, we are to step in line and obey. As a philosopher, I’m constantly shocked not only by how poor the arguments coming out of Christian circles are about ethical, political and metaphysical issues, but that Christians communicate their opinions through decrees. “The Lord says” is seen as an effective argument–and the reason some think it effective is because they’ve been conditioned by the sermon. The one thing I see both in my classes and in those coming to my church because they are done with other church communities—is people want freedom to talk, to be wrong, to work out their salvation with fear and trembling as God works within them. But sermon does not allow this. At this point many will say, well we have space in our church for conversation; they are called small groups. But notice how strange this answer is from those who have elevated the sermon: we are spending the vast majority of our collective time, collective resources and collective energy creating events in order to ensure that discipleship and engagement with the scriptures effectively occurs … somewhere else. I imagine many of us, especially those who have not constructed a multi-million dollar facility with all eyes pointing toward the podium, are looking for good ideas to replace the sermon. In the next few weeks I will bring up a couple of other issues caused by an unhealthy elevation of the sermon, and prescribe a host of ways to rethink our liturgy. First, is the critique of the sermon worthy? Have we overemphasized the teaching portion of our gatherings to our detriment and how? Second, how do you solve this problem? What replaces the sermon? What does your liturgy look like? One last note, my own church has been wrestling with replacing the sermon for a year now. It doesn’t happen over night. Even for the thoroughly convinced is quite difficult. If you go down this road, as a practitioner or as someone encouraging a leader, it is tricky and requires small changes, lots of perseverance, prayer and creativity. I look forward to dialoguing with you about these topics.